Cast iron is the darling of the culinary world. It’s versatile, timeless, high quality, and tough as nails. It will last you a lifetime if you give it a little TLC from time to time in the form of cleaning and seasoning. “But,” you might be thinking, “I’ve always heard that cast iron is a pain to maintain.” We’re here to prove that wrong. Taking care of your cast iron doesn’t have to be a chore. With the tips below, it will become a habit in no time. If there isn’t any baked-on food particles or sticky residue, then follow these instructions for cleaning your cast iron. 1. While cookware is still warm (not hot) rinse with hot water. 2. Use a stiff-bristled brush (without soap) to scrub the inside, removing any remaining food bits. 3. Pat dry with a towel and let sit in an open air rack. 4. If the the finish looks black and shiny, you’re all done! If the finish is starting to look marbled, dull, or gray, then you can spritz the surface a few times with our Cast Iron Conditioner. Dab the conditioner into the cast iron with a paper towel or lint-free cloth. 1. Remove all food particles from your cast iron cookware using a a plastic pan scraper or one of our chain mail scrubbers. 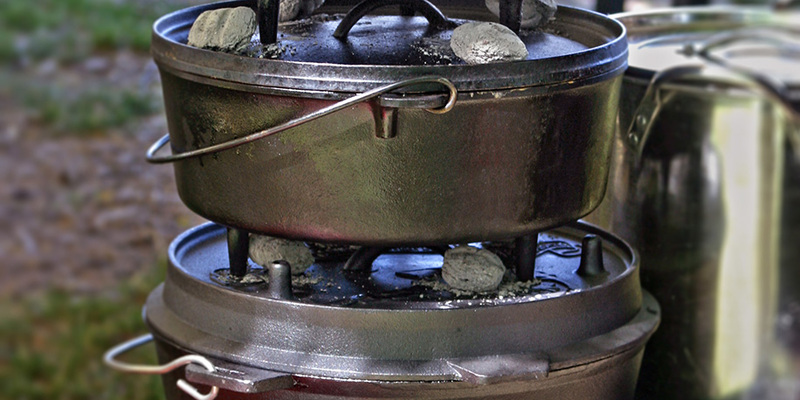 A chain mail scrubber works really well because it’s tough enough to remove stubborn food (and even rust), but it won’t scrape off your cast iron’s finish. 2. Fill the dish with hot water and add about 2 teaspoons of Cast Iron Cleaner. Rub the cleaner in with a plastic brush or clean rag. 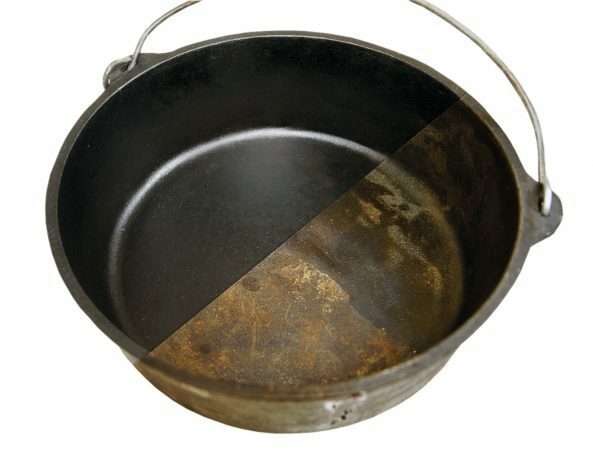 If you’re dealing with stubborn or burnt food, let the pan sit with the water and cleaner for about 10 minutes, then scrub. You can also try boiling the water to loosen any residue. 3. With a stiff-bristled brush, scrub the remaining food bits away and off the iron. Rinse well and pat dry with a towel. 4. While the dish is still warm, spritz all surfaces a few times with our Cast Iron Conditioner (mentioned above) and dab it around with a clean paper towel or lint-free cloth. Congratulations, you’ve just cleaned and seasoned your cast iron cookware. See how easy it is? Check out our walkthrough video if you want to see the methods in action. And if you have any other pro tips for cast iron cookers, let us know in the comments below!